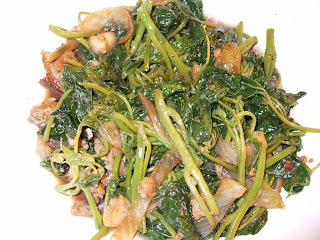 Lately, I've been craving adobong kangkong. I was so happy when I went to the Fil Store on week end I found kangkong there. I made this for lunch today. My babe dako didn't ate any of it because I cooked with some fish. I knew he's not gonna eat my kangkong adobo so I cooked meat adobo for him, see below he loved it. 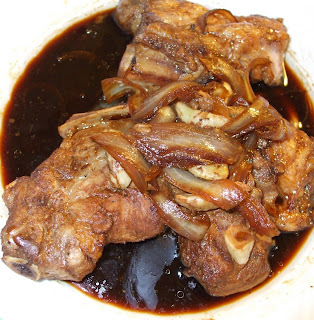 I marinated with soy sauce, onions, garlic and vinegar.Then, put them in the oven instead of cooking in the pan. He even ate some for dinner tonight so I skipped cooking eh! Happy Me! Look alike Malaysian dishes... Probably that is Asian Style cooking? Make me hungry!